"Two Words" is a track on Kanye West's debut album. It might as well be the theme song for the market and Federal Reserve too. When the Fed issues its policy statement on Wednesday afternoon at 2 p.m. ET, the only two words that may matter to Wall Street are "considerable time." Here's why. 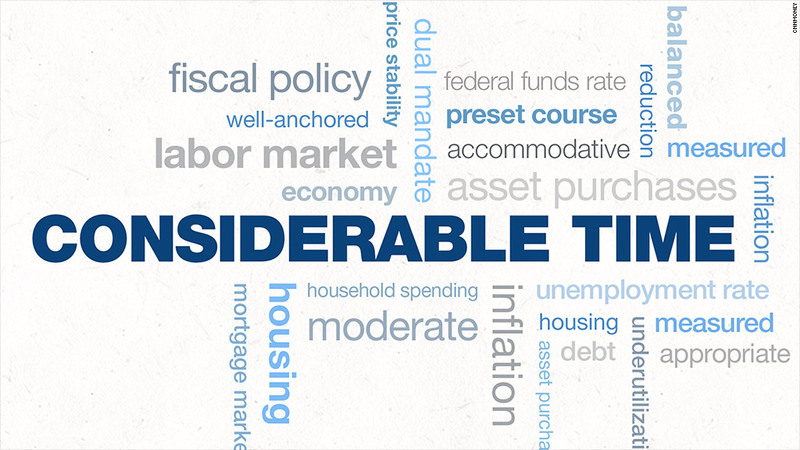 The Fed has used these words to describe how long it will be before it starts to raise interest rates again. The central bank cut its key short-term rate to near zero at the height of the credit crisis/Great Recession in December 2008. Rates have been at those historic lows ever since. And even though the economic recovery has been painfully slow and inconsistent for many, it still is a recovery. So are rate hikes coming soon? The answer to that question is also the name of Kanye's collaborator on "Two Words" -- Mos Def. It's just a matter of when. There will be a lot of words in the Fed's statement. But Wall Street only cares about two. If "considerable time" remains in the statement, Fed watchers will assume that the central bank is likely to keep rates near zero until next summer. That's what Wall Street is hoping for right now. Stocks rose on Tuesday after the Wall Street Journal's Fed reporter suggested that "considerable time" is going to stay in the statement. But if those words are removed, there will be instant speculation (and probably a lot of market jitters) about the Fed possibly moving to raise rates as soon as next spring. "If the Fed wants to leave the door open for a March interest rate hike, it will need to drop the 'considerable time' language," said Zach Pandl, senior portfolio manager and interest rate strategist at Columbia Management. "This indecision's bugging me" Pandl thinks the Fed will probably keep those two words in the statement Wednesday. But obsessing about if they should stay or should they go now may be a moot point. (If they go, there will be trouble?) 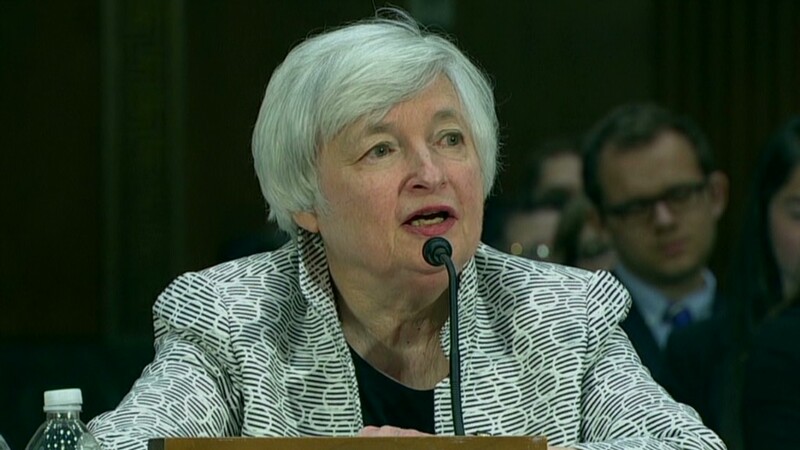 Pandl said it is a "virtual certainty" that the "considerable time" language will be cut from the Fed's next statement in October. That makes sense. The Fed is expected to announce Wednesday that it is going to cut, or taper, the size of its monthly bond purchases one last time before ending the program, dubbed quantitative easing or QE, altogether in October. So it will be more appropriate then for the Fed to begin discussing the timing of interest rate hikes. But not everyone agrees. Steve Van Order, fixed income strategist for Calvert Investments, argues that the Fed should hold off on changing the statement until December. He thinks QE should officially end first before the Fed worries about rate hikes. Van Order added that the problem with the "considerable time" language is that there is really no consensus on what it exactly means. Janet Yellen goofed in her first press conference as Fed chair back in March when she said it could be six months after QE was over. But couldn't a "considerable time" be three months? Or nine? "How much time does the Fed really need to set the market up for a rate hike that is still months away?" Van Order asked. Rate hikes are coming. Get used to it. Fortunately, it appears that investors are already prepared for the inevitable rate hike. Bond yields have ticked higher lately, and that's usually what happens when the Fed is getting ready to raise rates. Stocks have been more volatile too. But investors should also not lose sight of the fact that a rate hike is sorely needed and should be welcomed. It means the economy is finally strong enough to handle higher rates. Related: Don't freak out about the Fed! The Fed has been in fire-fighting mode for nearly six years. The flames are out. The Fed can put down the hose. But the Fed also knows that it shouldn't move so quickly and risk killing the recovery either. That's why it has to continue to focus on the data. 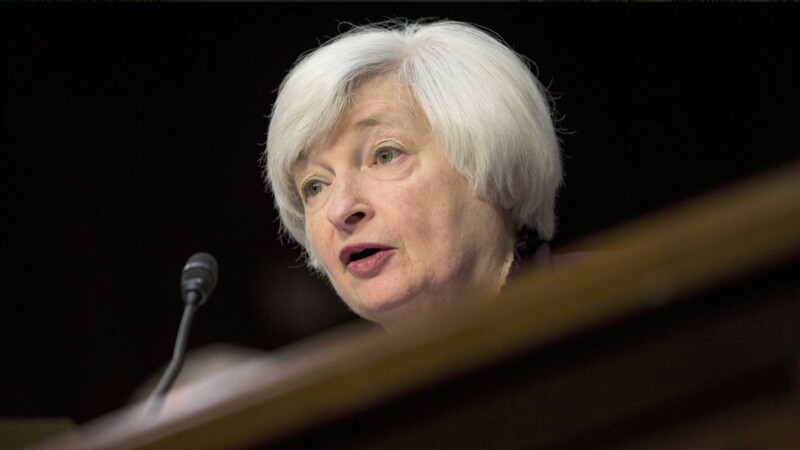 "Yellen will not want to make the mistake of tightening too soon. If they are going to make a mistake, it will be waiting a little too long to raise rates," said Sam Wardwell, investment strategist at Pioneer Investments.